"And that is how I got free of my isolation" documents the experiences of some of Canada's self-advocate leaders as they have moved to increasingly independent lifestyles and environments. Participants include Arnold Bennington, John Cox, Gordon Fletcher, Keith Ford, Shane Haddad, Allan Harris, Allan & Marianne Hullman-Hall, Barb Munholland, Rick Sam, Donna Smith, Janet Snazelle, and Don Thibault. The interviews were conducted and filmed by Patrick McDonagh at the 2001 People First of Canada annual conference in Saskatoon, Saskatchewan. The resulting footage was edited by Deborah Dunn. 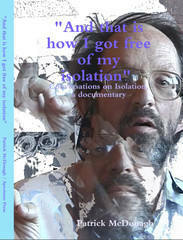 The DVD is published and distributed by Spectrum Press, a branch of the Spectrum Society for Community Living. All proceeds from the sale of the DVD go to the Spectrum Press, to assist in telling the stories of people with disabilities. Click here to purchase.